Here's a yummy, college-student-friendly, homecooked meal that you can a) pay for with the money you found in your couch, and b) cook for two in less than ten minutes: Fried Catfish, wild rice and a handful of sweet, crunchy sugar-snap peas. a) Fish 'n chips are back. They're the new thing. There are at least four fish 'n chips places in Manhattan's Lower East Side alone! So by making fried fish at home, you're avoiding the chips and the deep fryer and being excessively hip. b) There's actually very little grease in this recipe - just two tablespoons or so of a heart-healthy oil like canola, or even olive oil. And most of that gets poured off. c) Fried fish is extremely easy to season (i.e., salt and pepper) - so it doesn't take expensive fresh herbs, an elaborate spice rack, or epicurean know-how to make it delicious. On a plate, combine cornmeal, salt and pepper. Rinse catfish and pat dry. Toss in cornmeal mixture, coating all sides. Warm oil in a large pan over medium heat until hot but not smoking. Add breaded filets. Cook about 4 minutes on each side, or until inside is white and springy and outside is crispy. Transfer fish to paper towel, then to plate; pepper to taste and serve hot with ketchup on the side. J and enjoyed our catfish this evening with wild rice (shh! from a box!) and raw, crunchy, wonderful sugar-snap peas. It was so good that when J's roomie came in and sampled our dinner, he ran out to the market for more fish! What? People don't fry fish anymore? 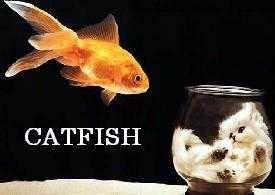 Your catfish looks delectable! I'm all for it. Reminds me of fish fries in the Great Smokey Mountains, while camping on family vacations when I was a child. Although not a giant Mekong, my dad caught huge amounts of rainbow trout and mom fried them up on a camp stove. Cooked like your recipe and oh, so delicious. Makes me want to cook but mostly makes me want to eat! Lovely tones in the first picture!